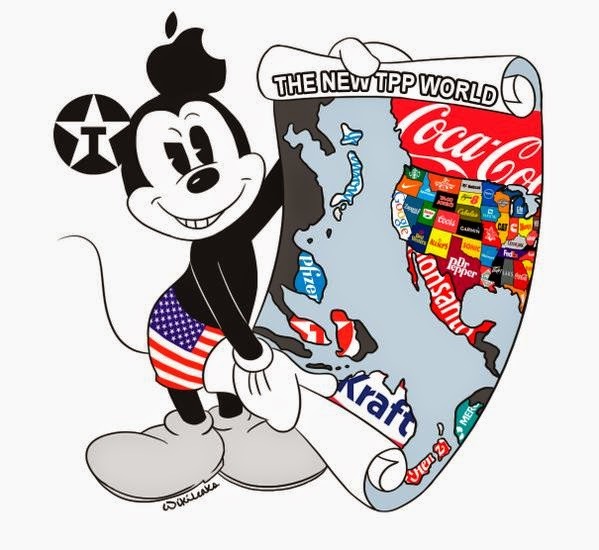 The Trans-Pacific Partnership (TPP) “Investment Chapter” was released by Wikileaks on March 25, and revealed a rather confused view of what has been going on during the secret trade negotiations between the 12 parties representing 40 per cent of the world’s GDP (Vietnam, USA, Singapore, Peru, New Zealand, Mexico, Malaysia, Japan, Chile, Canada, Brunei, Australia). The TPP Investment Chapter is dated 20 January 2015. According to Wikileaks, the document is classified, and to be kept secret for four years from either the completion of the agreement or, should it not come to fruition, the close of negotiations. Presumably, after four years the TPP will have been normalized to the extent that it will no longer be “news”. There is simply no other way to explain why the citizens of the affected nations would be denied access to information on how their labor, assets, and national patrimonies are being peddled. But perhaps we should know. The TPP is, after all, the largest economic treaty in history. But in fact the rights of the nation-state, and of its citizens (the word “citizen”, for what it’s worth, does not appear once in the document), are quite severely curtailed. Governments are not allowed to expropriate or nationalize “a covered investment”, “either directly or indirectly”. This looks not unlike the domestic laws now in place in some jurisdictions that allow for expropriation of lands to extend power and transportation corridors. In fact, no domestic government would curtail its economic power within its own borders to the extent that the TPP would require it to. There is, for example, no rule in Canada saying that a government can’t take ownership of a business entity, for whatever reason, though political realities make this a factor only in extreme circumstances, and with compensation paid. The TPP is odd in that it gives specific permission in only one area: for public purpose. That in itself is an entire area of law, with many contested understandings. If a Japanese consortium wants to buy a chunk of central British Columbia, and drive a pipeline through it after getting the OK from the provincial government, could the federal government expropriate the land and pay “fair market value” because it was deemed non-discriminatory and for the public good? Who knows. In modern industrial history, this would have been the end of the Auto Pact between Canada and the United States, and would have made impossible Japan’s economic expansion after WWII. What is particularly worrying about these stipulations is that they lock in one economic model, and give societies little room to move. A fixed barter system based on surplus commodities, for example, could be disallowed as a form of export quota. Attempts to boost domestic industries by ensuring them a cut of the pie would also be disallowed, as would any form of preferential purchasing intended to strengthen domestic supply chains. In this light, the Canadian government’s timeline for privatization of the Canadian Wheat Board by 2016, and the removal of its purchasing monopoly, makes sense, as it would have seemingly contravened the provisions of the TPP. The agreement clearly states that governments can adopt measures “necessary to protect human, animal, or plant life or health” and “related to the conservation of living or non-living exhaustible natural resources,” so long as they “do not constitute a disguised restriction on international trade or investment”. Not sure how that works. Would an outright ban on having a foreign firm buy a lake and export the freshwater be a restriction on international trade and investment? Maybe. With regard to disputes, arbitration is by tribunal: one member chosen by each party, and one agreed to by both parties after appointment by the Secretary-General. The tribunal is to abide by international law, but can over-ride this to conform with “the rules of law specified in the pertinent investment authorization or investment agreement.” As well, access to arbitration expires three and a half years after a claimant “first acquired, or should have first acquired, knowledge of the breach”. There is no mention of domestic court structures or laws: the tribunal is to follow a combination of international law and the rules set out in the agreement. Its decision is final. The best example of this in present law is Chapter 11 of the North America Free Trade Agreement. The nightmare scenario is the Canada-US softwood lumber dispute, a multi-decade saga in which it was determined that Canadian stumpage fees were unfairly low, effectively outlawing a government's ability to price its own resource. Julian Assange, WikiLeaks' editor, has said the TPP “is a challenge to parliamentary and judicial sovereignty.” He is right in the sense that the agreement is self-policing, negotiated outside the World Trade Organization's (WTO) framework, and in that future generations are locked in to a largely corporatist view of economic policy. The “BRIC” countries – Brazil, Russia, India and China – are absent from these negotiations, presumably because they want to maintain more economic control over their trading relationships.